Searching for more drinks to make with my Swedish punsch, I found yet another entry in Erik Ellestad’s ongoing stomp through the Savoy. This one is the Broadway Smile. Use liqueur glass and pour carefully so that ingredients do not mix. I have never attempted a pousse-café style drink. How hard could it be? Apparently a little harder than I thought. The trick I’ve always heard is to pour each layer over the back of a spoon. So I poured in the créme de cassis. I measured out my punsch, readied my spoon, and poured slowly. Only to see it start to dilute and mix with the créme de cassis. There was close to an appearance of layers, just that my Swedish punsch had developed quite a purple hue. Well, this is a first attempt, I told myself, and tried the Cointreau layer. That didn’t even pretend to make a layer, just diluted the purple all the way through. Aside from the lack of experience, I suspect I was destined to fail because of my specific ingredient selection. The layers of pousse-cafés rely on carefully selecting for each additional layer a liquer of lower density, so it will be able to float on the lower layer. 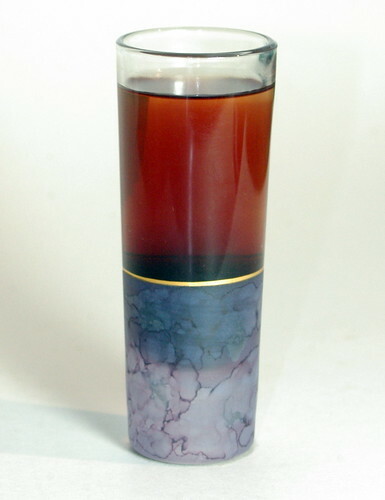 The Briottet créme de cassis seems to be very light and thin compared to other choices, such as the Marie Brizard Erik used. My Swedish punsch is definitely less dense than the commercial punsch I’ve had. At least this wasn’t a complete fail. Mixed together, these were quite tasty, and since I was making a small drink, the sweetness of all that liqueur didn’t totally overwhelm me. Naturally, I was tempted to keep my cocktail fail a secret, but then I thought maybe you, gentle reader, would be entertained not just by stories of success, but by admissions that we cocktail bloggers are not always perfect geniuses who mix up perfect drinks. So I ask you a favor, please answer the poll below to let me know. This was really educational and entertaining Stevi! i must search my memories for my own failures to post in the future or post future failures because i do fail too! I think my most common failure is of too many things going on in a drink at the same time. Hey, what a nice glass you have! Yeah, homemade liqueurs can throw a wrench into layered drinks. Even, as you observe, different commercial brands of liqueurs can have different specific gravities. Plus, the high proof of Cointreau always makes it a tough liqueur to layer. It does really help to use a pour spout on the bottle when you are doing layered drinks. Or to get all super made scientist, like Darcy O’Neil, and use a pipette: How to Make a Layered Shooter. I definitely think it is cool to hear about cocktail experiments, whether they fail or succeed. My first (and only) attempt at a pousse cafe also resulted in fail. If I ever got the urge to try it again, I was going to actually bend the spoon so it could go down in the glass (and use a pour spout). But now (after reading Darcy’s post) I think I’d use a pipette. I think it is totally appropriate to blog about non-successes because it does make things seem more normal and approachable.